Canada's Public Safety Minister says he's asked his American counterpart to monitor those obtaining U.S. travel visas for the sole purpose of crossing the Canadian border. Canada's Public Safety Minister has told his American counterpart to keep a "wary eye" on the travel visas it issues to the United States. In an interview Sunday with CBC News, Goodale said Canadian officials have identified trends where documents issued from certain U.S. embassies and consulates are being misused. "We have asked them to go back upstream and examine the pattern of these travel documents being issued and how come the people to whom they were issued appear to have had no intention of staying in the United States, but were simply using the documents as vehicles to get into the United States and then make a beeline for the Canadian border," Goodale explained. Will Donald Trump's latest travel restrictions push more asylum seekers into Canada? "They're examining what they can do to communicate," Goodale said. 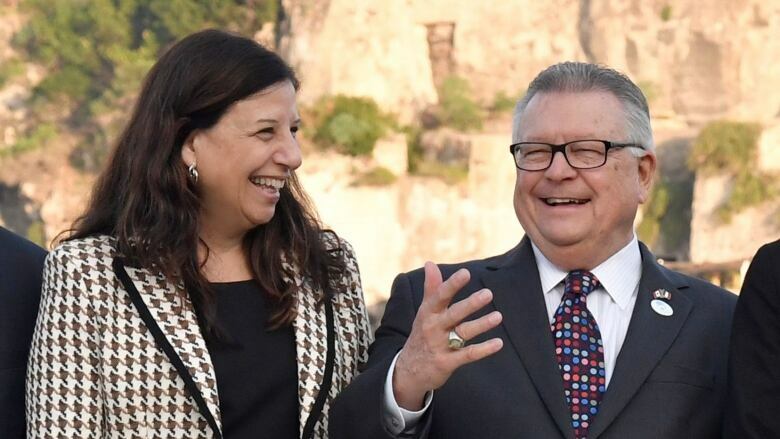 In a news release today about the meeting at the G7 summit of interior ministers in Ischia, Italy, the department of homeland security reported Duke and Goodale talked about "joint steps to take to address illegal migration across their shared border." Goodale said he asked Duke to consider alerting Canadian authorities when the U.S. is about to make policy decisions that would affect the border, in order to give agencies such as border services time to prepare. This summer, thousands of Haitians streamed into Quebec at an illegal border crossing after the United States announced it would not extend temporary protected status for Haitians who have lived in that country since the devastating 2010 earthquake. Goodale said G7 ministers also spent a lot of time talking about fighting extremism of all kinds, and how to prepare for the return of citizens who have been fighting in Syria and Iraq. "What happens to the foreign fighters, the people who have come from various Western countries to the fight in Syria and Iraq, and now if the battlefield activity is winding down, where do they go and what do they do", he said. Security agencies around the world will have to identify and track those people, Goodale said, and determine the risk they pose as well as preserve evidence of any battlefield crimes before figuring out if and how they could be prosecuted in the future.